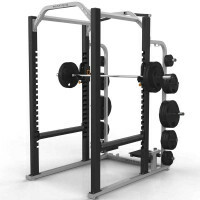 The Squat Rack can accomodate over 600 pounds of plate storage, using its brushed chrome-plated weight horns. 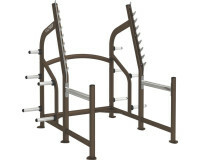 The bar holders are 5/16“ thick and feature two catch positions. 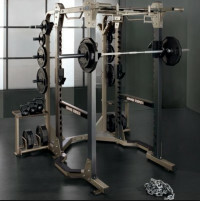 The Power Rack is designed to allow ease-of-use with the 0-90º bench. 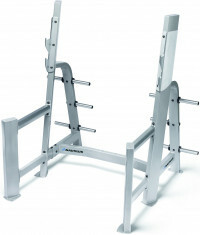 It has a workout area of 42” by 88”. 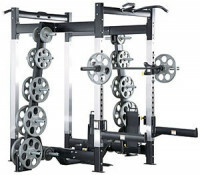 The J-hook racking system has a locking mechanism. 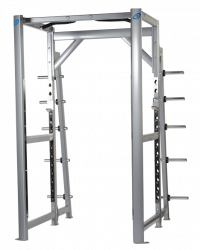 This rack also features a built-in ergonomic chin bar with multiple grip positions, and has a maximum lift load of 1000 pounds.